Pixies of the Forest slot is a game with a fantasy-magic theme. It’s the second slot from IGT to feature Tumbling Reels (N.B., the first being Da Vinci Diamonds), and as well as being able to deliver multiple wins from a single spin, it offers a free spins bonus, wild substitutions, and a top jackpot that pays 2,000 times your triggering bet. 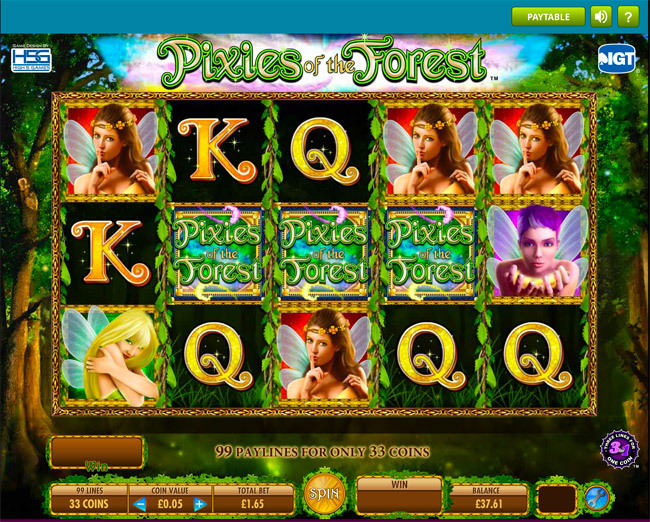 Pixies of the Forest slot is a five-reel game with 99 paylines, and 3 rows of symbols. The RTP (Theoretical Return to Player) of 93.00 to 94.90%. Aside from its enchanting theme, what makes the slot such an attractive option for many players is the fact that you can play with 99 paylines for as little as 33 coins, as rather than charging you one coin per line, you get three lines for every coin. There are several coin value settings to choose from, which allow you to take a spin for a minimum of 33p and a maximum of £99. The setting of Pixies of the Forest slot is an enchanted wood, and a magical haze fills the sunny skies above while the tiny glows of pixies and fairies can be spotted in the trees. The soundtrack consists of relaxing harp music accompanied by birdsong and the laughter of the mischievous pixies who appear on the reels. The Pixies of the Forest slot uses nine different symbols, and in order of value from highest to lowest, they are the Pixies of the Forest logo, the purple-haired pixie, the brunette pixie, the blonde pixie, the A, the K, and the Q. There’s also a “Bonus” scatter and a “Wild”, and the wild can be used to substitute for any paytable symbol except the scatter to help make winning combinations. The Tumbling Reels Feature used in the slot gives you the potential to create consecutive wins with a single spin. This is because whenever a win is formed, the symbols that are used to create it vanish from view, allowing their empty spaces to be filled with new symbols falling down from above. The process continues until no more wins can be formed. The Free Spins Bonus is triggered with three Bonus symbols on an active payline. When you unlock it, you’re prompted to pick one of the three Bonus symbols to reveal the number of free spins you’ll receive. In the bonus round, it’s easier to create wins than in the base game, as the wild symbol usually only appears on the second, third, and fourth reel, but in the free spins round, it can appear on the first reel as well.